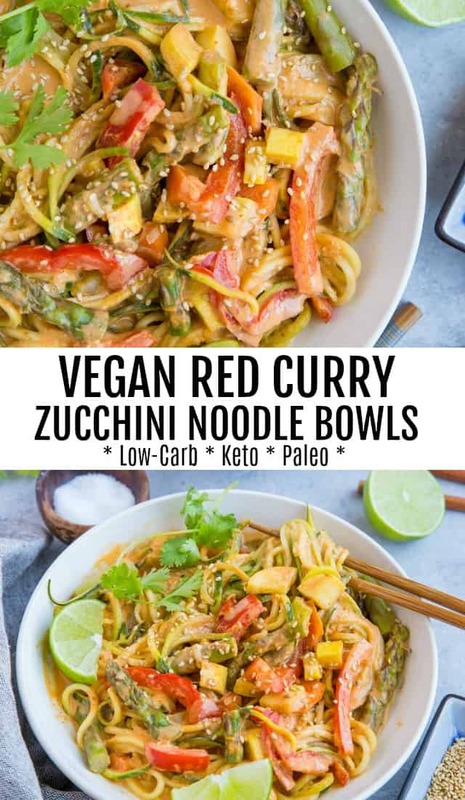 This plant-based vegan red curry zucchini noodle bowl is fresh, frisky, and comforting while keeping it low-carb. I’ll be the first to admit I don’t reinvent the wheel when it comes to curry. I make curry nearly weekly, and while I can 200% go the authentic route by grinding my own spice blend, I am not at all above using a store-bought curry paste. It just makes dinner easy in a pinch! 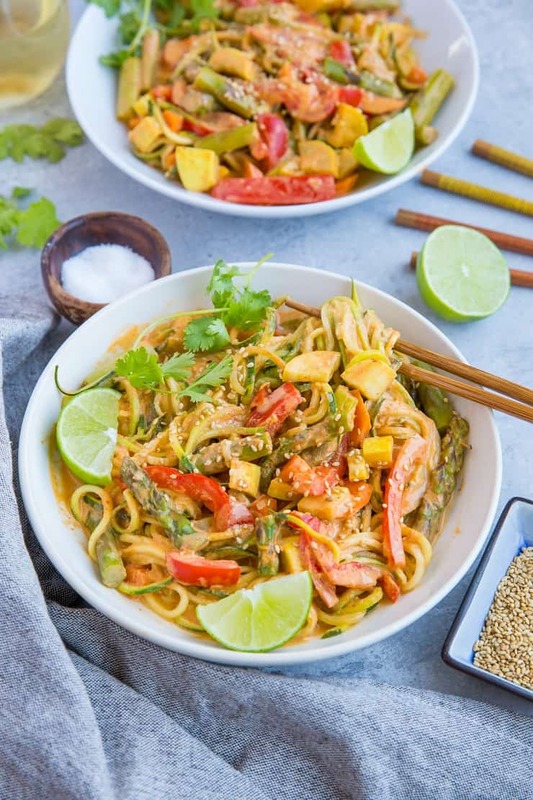 Using fresh summer vegetables, I whipped up these red curry zucchini noodle bowls. Essentially what we have is a big dose of vegetables swaddled in a beautifully flavored red curry coconut milk sauce, which we make using nothing more than coconut milk, red curry paste, and some fresh ginger. My friends who can tolerate a higher amount of FODMAPs, feel free to toss in a few cloves of garlic! 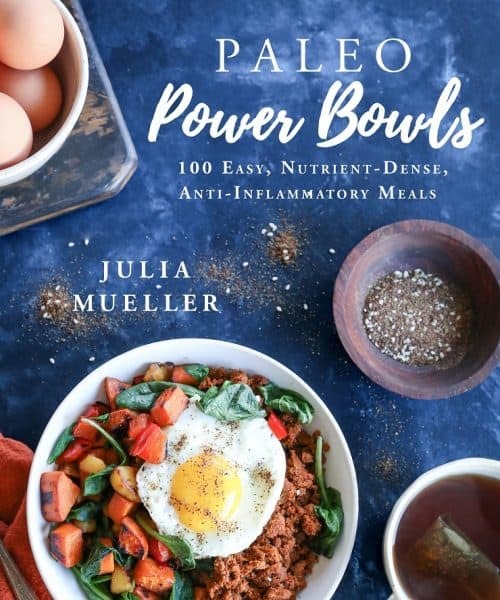 If you follow a paleo, keto, or low-carb protocol or if you just love a good clean meal from time to time, these bowls may just become a staple in your household! 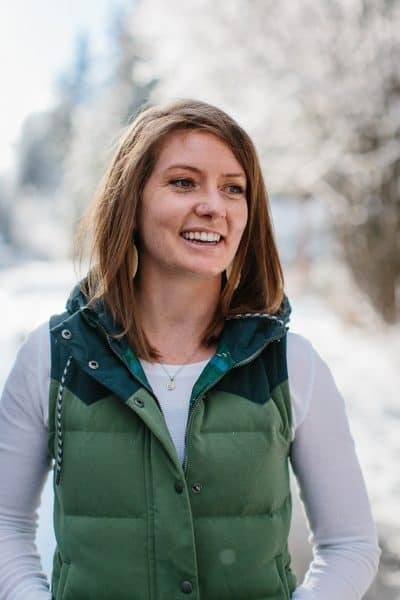 Depending on the season, you can change up the type of noodle – for instance, this winter, you can go with butternut squash or sweet potato noodles and add in some winter veggies. 10 points for adaptability! Add your choice of chickpeas or tofu for plant-based protein. Add shrimp, chicken, or pork for animal protein. 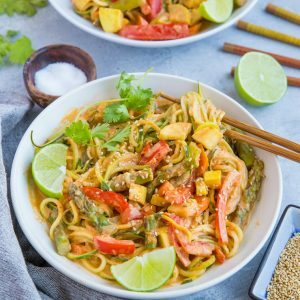 Swap the red curry paste for green curry paste, or replace with equal parts yellow curry powder. Incorporate your favorite in-season vegetables. Add 3 cloves minced garlic to the sauce if you can tolerate it! If you’ve been in the mood for zoodles now that zucchini season is in full swing, also check out my Avocado Pesto Zoodles with Spinach and Sun-Dried Tomatoes, Thai Zucchini Noodles with Sesame Almond Ginger Sauce, Mediterranean Zucchini Noodle Pasta, and Dairy-Free Zucchini Carbonara. Add the ingredients for the sauce to a wok or deep-edged skillet. Heat to medium and bring to a gentle boil. Reduce heat and continue cooking, stirring occasionally, until sauce thickens, about 8 to 10 minutes. While sauce is cooking, chop the vegetables and spiralize the zucchini. Increase the heat on the sauce to medium-high and add the carrots and bell pepper. Cook, stirring occasionally, until vegetables begin to soften, about 3 to 5 minutes. Add the zucchini noodles and yellow squash and stir well until all vegetables are coated in sauce. Cover and continue cooking until zucchini noodles have softened, but are still al dente, about 3 to 5 minutes. 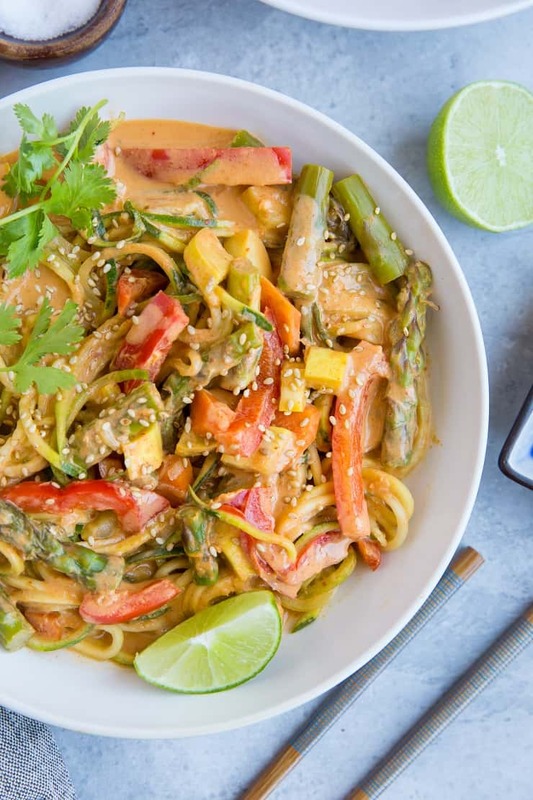 Serve red curry zucchini noodles in bowls with lime wedges, sesame seeds, green onion, and cilantro. 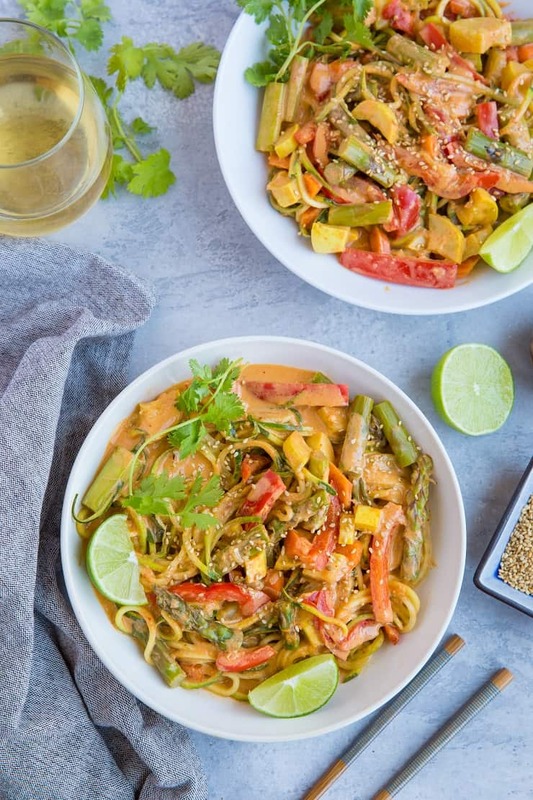 I’ve been on a thai peanut zoodle kick lately and it’s time to switch gears a little and go curry! This is right up my alley with that creamy coconut curry. This will be so good with sweet potato or butternut squash noodles too!